33 Years and Going Strong! Since 1980 Precision has built its business by designing and building gas processing plants, chemical and processing plant components, and skid packaged equipment including, tanks, HRSG, boilers, re-boilers, compressors, separators, heat exchangers, filtration systems, dehydration, and dew point control for natural gas processing facilities. 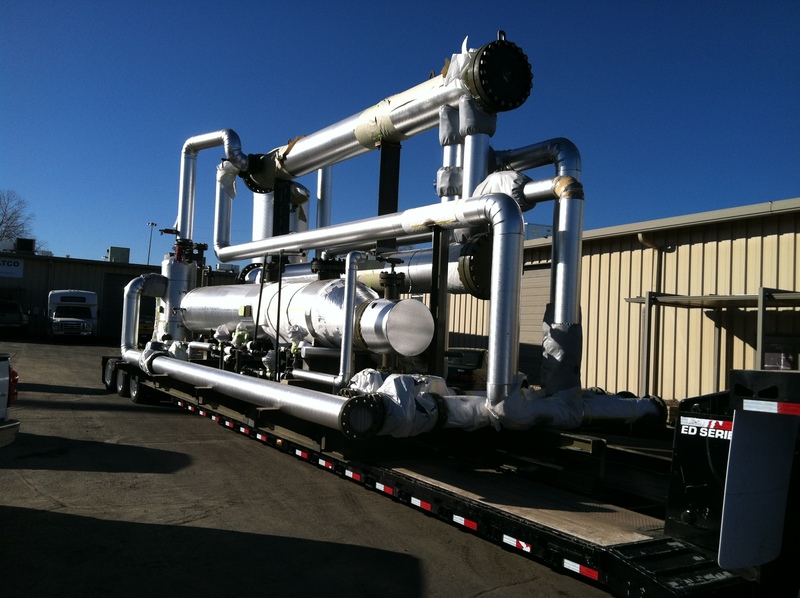 Precision has also built several catalytic reactors for specialized applications, slug catchers, pulsation bottles, scrubbers, oxygen service vessels, flow meters, gas valve trains, accumulators, and complete skid packages. Precision provides it’s customers with consulting, design, engineering, and ASME calculations. Precision can also provide in shop and mobile ASME vessel repairs and rerates, hydro testing, machining, welding (including ASME “R” stamped repairs, inspection services including borescope video inspection. Most importantly, Precision is commercially distinguished as a business that offers it’s clients much more than a typical fabrication and welding shop. Precision has built a reputation and is known to provide resources and knowhow for sustainable advantages in technology and project development. Precision uses it’s decades of experience and knowhow to offer value added solutions to our clients projects and fabrication needs. This often saves time and money on projects and prototyping that bring long term value to our clients. In 2013, Precision will continue our 33 year history building processing plants and equipment with a focus on natural gas processing. The biggest difference is our new, state of the art, 40,000 Square foot fabrication facilities. If you have a project and you need an experienced, knowledgable, and well qualified manufacturer please allow us the privilege to provide your company with a competitive quote. Since this summer Precision Pipe and Vessel, A Denver ASME welding and fabrication shop has built and delivered two 80 foot plus deethanizor and depropoanizer towers. By all standards these are not the largest towers on the market, but are a large enough to serve a major sector in gas processing plants. These towers were built in Denver and will be shipped all the way to Pennsylvania for their final installation. This project was conducted with a Nationwide RFP process and it was discovered the Precision Pipe had a competitive price (even with expensive trucking costs) and even better delivery schedule. As the gas boom seems to be gaining traction, it seems many ASME shops are becoming back logged with large vessels such as these. Many gas processing companies turn to the same fabricators over and over again and are willing to wait months for delivery at the expense of production and revenue. As project managers become familiar with companies they tend to turn to the same companies time and time again. This is probably a safe bet with long established business relationships, but the petroleum is a high risk high reward kind of business. From the early stages of drilling, installation, permitting, and well stimulation this is in all reality a high stakes business. Any company that is seeking a competitive edge should be looking for energetic and motivated businesses qualified to provide the same products on a better delivery date (any ASME code vessel will require the same QA QC and inspection). The cost of lost production is much more expensive than a few thousand dollars in added cost or even shipping, yet procurement specialist and project managers turn to the same companies over and over again without looking at the competitive advantage they may have by using a new vendor with better delivery times. As dollars are wasted waiting for equipment it seems more logical to strike up new business relationships based on better delivery schedules. Give us a call and see if we can get you to revenue quicker than your go to guy, you might be surprised!